NOTE: Due to the recent demand for interviews and speaking engagements, based in part on current events in Lebanon, we have created this page to aid in identification of a speaker that fits your needs. The individuals listed on this page have volunteered to help with the recent media requests and are "forward leaning". There are of course, others that we can contact on a case by case basis. contact information is not provided on this page. contact information, preferably cell phone to the email below. This removes one step in the process and improves turnaround. Attempts are made to be timely in response. Usual response is within 4 - 12 hours. expenses or other associated costs. These issues should be directly negotiated with the individual that you wish to speak with. BACKGROUND: MAJ Bob Jordan, USMC (RET) was a Public Affairs officer in Beirut, Lebanon from Aug 1983 to Nov 1983. He was in Beirut at the time of the Marine Barracks/BLT bombing on Oct 23, 1983. He is the founder and Past President of the Beirut Veterans of America. MAJ Jordan has made numerous major television appearances including the Discovery Channel as well as recent C-SPAN and CNN interviews. He is co-author of the current book: "Is America Safe?" BACKGROUND: Warrant Officer Randy Gaddo, USMC (RET) was a Public Affairs professional in Beirut, Lebanon. He was in Beirut at the time of the BLT bombing on Oct 23, 1983, then a SSGT. He is an officer and active member of the Beirut Veterans of America. CWO4 Gaddo has appeared on CNN Presents and has been the subject of numerous magazine and newspaper articles, as well as authoring many himself. He is also responsible for photographing much of the imagery that details the bombing, before and after. Images courtesy KMI, IMDB, Warriors, Inc.
BACKGROUND: CAPT Dale Dye, USMC (RET) was a Public Affairs officer in Beirut, Lebanon from Sept 82 - May 83. He was in Beirut at the time of the US Embassy bombing on April 18, 1983. CAPT Dye is a Hollywood military advisor and has consulted as well as appeared in several major films. CAPT Dye, his work and his company are the subjects of many magazine and newspaper articles. He is also an accomplished book author and radio personality. BACKGROUND: SGT Steve Russell was and remains the only eyewitness to the Marine Barracks bombing. He was serving as the Sergeant of the Guard on the morning the bombing occurred - 23 Oct 1983. Steve has appeared on A&E Investigative Reports, independent documentaries and the Discovery Channel specials "Real Mash: The Wold of Combat Medicine" and "History Undercover: Suicide Bombers". 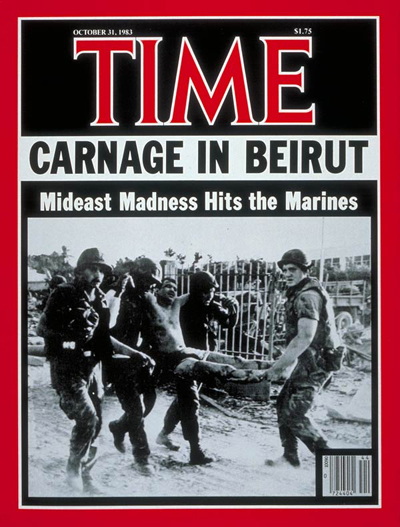 BACKGROUND: Armando Ybarra was severely wounded in the bombing and is the U.S. Marine being carried in the photo to the right, appearing on the cover of Time magazine on 31 Oct 1983. Mr. Ybarra has been in demand due to many people remembering the photo and satisfying their curiosity about how he survived his tragic wounds. Armando has appeared on the "History Channel", "Inside Edition" and "War Stories with Oliver North". BACKGROUND: Dave Madaras was a 22-year-old U.S. Marine serving with the 24th MAU in Beirut, Lebanon, 1983. Dave participated extensively in the rescue operations. He's pictured in the photo on the far right carrying Ybarra's legs. He has appeared on the History Channel's "Operation Reunion" and Discovery Channel's "History Undercover: Suicide Bombers". BACKGROUND: In the aftermath of the October 23, 1983, tragedy, Judith Young began a support group with Joan Muffler, who had also lost a son in the Beirut bombing. The Beirut Connection began locating and uniting those who lost sons, fathers, and brothers to the bombing. Eventually it merged with the Beirut Veterans Association. They also initiated a Beirut Stamp initiative. Judy Young has appeared on A&E Investigative Reports, independent documentaries, ABC's Nightline, and has been quoted in numerous papers and magazines. Judy has also served as the national president of Gold Star Mothers, and is pictured to the left with Gen Hagee, USMC, the 33rd Commandant of the Marine Corps. Judy's son, SGT Jeffrey D. Young, USMC, was killed on 23 Oct 1983 in Beirut Lebanon in the Marine Barracks bombing.